During this course, run by Field & Field, Iain McGilchrist spoke to us twice a day, for an hour and a half at the start of the day and an hour and three quarters in the late afternoon, although these times were flexible and usually ran over. He also ate with us and had coffee with us, as well as making himself available during the day for discussion and questions. He was very generous with his time. I tried to take comprehensive notes of his talks, although he speaks fast, sometimes reads and doesn’t always use slides, so it wasn’t easy. Perhaps he would say, as one of the participants said to me, it is enough to be in the experience, we don’t need to record everything. Last year I had a similar discussion with a close friend about taking photos and blogged about it then – Photography and ‘Living in the Moment’. So this is the first in a series of blog posts that I will make about what I have heard and learned. I did this last year. These were the posts I made then. So this is the second time I have attended this course. To repeat what I wrote last year, these posts should not be read as what Iain said, but as what I think he said, i.e. my interpretation. Every one of the 40 participants will have heard something different. We each attend to the world from our own perspective, from our own right and left hemispheres. If you are reading this post and have a different perspective, I would welcome your comment. The course was highly stimulating and I loved the discussion between participants, so it would be great to continue this. Now to write about the first session. This first session covered an introduction to the divided brain and a discussion of why hemisphere differences matter (in particular asymmetry – front and back, top and bottom, side to side), some current understandings and misunderstandings. The session was similar to last year’s Day 1. I noted some of the same content, but also some differences. Perhaps it would be good to start by reiterating something Iain said frequently throughout the course and that is that we always use both hemispheres of the brain for everything, but each hemisphere contributes something different – so, for example, it would be wrong to say that creativity or emotion are functions of the right hemisphere only. An analogy for the functions of the left and right hemispheres is your glasses and your eyes. Your eyes (your right hemisphere) are more important than your glasses (your left hemisphere). If you wear your glasses with your eyes shut, then your glasses serve no function at all and you see nothing; but if you don’t wear your glasses and have your eyes open, then you can’t see properly. Although I attended this course last year and have followed Iain McGilchrist’s work for a number of years, and although I had seen many of his slides before (if not all of them), I still came away with a sense of having learned more. 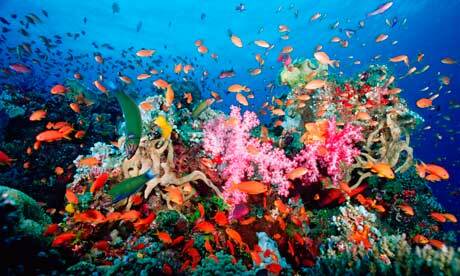 An image of a coral reef, like the one above, was the first slide we were shown. Its purpose is to demonstrate that the universe doesn’t work by the law of parsimony. It is not tidy nor ordered, but chaotic, super abundant and filled with a multiplicity of differential being. This is the world of the right hemisphere. The whole is more than the sum of the parts and this is what Iain realised on leaving school that he had not been taught. At that time a number of propositions that he held true seemed to be in opposition to what was being taught. He was being taught that the world is inert, but he knew it to be deeply responsive. He was being told that progress is linear, but he knew it to be circular; we arrive back at the place just above where we started. As a teacher I am reminded of Bruner’s work on the ‘spiral’ curriculum. I would also say that progress is not only circular but can be the result of multidirectional and backwards and forwards pathways, which calls into question prescriptive lockstep progression through a given curriculum and schemes of work. At the time Iain was questioning whether progress is linear. He feels that the purpose of the intellect is not to abstract, classify and generalise, but to pursue the unique and embodied. We have to make generalisations, but categorising is not the whole story. This interest in embodiment and mind/body relationships continued when he was studying English at Oxford under John Bayley, where Iain learned that the more you analyse something, the more you try to take something apart (e.g. literature or poetry), the more you put barriers up. Analysis is only an intermediary. We must go back to the whole, just as when learning to play a musical piece, we must ultimately forget the ‘learning to play’ in order to give the final performance. This seems to me to be an important message for researchers, i.e. don’t lose sight of the whole when steeped in data analysis. Why do we constantly stop at the point of analysis (i.e. in the left hemisphere)? Why does so much learning appear to be disembodied, when we know, for example, that reading poetry such as Wordsworth, or listening to music, can have a physical effect, changing our pulse and breathing, making the hairs on our skin stand up? This is a mind/body problem and it was questions like these, together with further study in medicine and psychiatry and a particular interest in what happens to patients with right hemisphere damage that led Iain to spend 17 years writing his world acclaimed book, The Master and his Emissary. The Divided Brain and the Making of the Western World. Iain also noticed that what is implicit loses its value when made explicit and from his work in medicine and psychiatry and discussions with John Cutting came to know that for patients with right hemisphere damage (such as schizophrenics) experience of the whole world changes. I do now wonder, retrospectively, whether trying to elicit tacit understanding through deeply reflective processes is counter productive, as by definition it makes the implicit explicit. I need to think further about this as some of my own research has focussed on eliciting tacit understanding. But we know from Iain’s work that the reason we have left hemisphere dominance is because the Emissary (the left hemisphere) fails to return what is learned to the right hemisphere, so we have to return what we have learned by making things explicit to the right hemisphere, and not lose sight of the whole. I didn’t get a sense from the course that any of us really know how to do this, but more of this in a later post. After this introduction to his thinking and the types of questions he is trying to answer, Iain turned his attention to the physically divided brain. The detail related to this is in the first part of his book. We could ask why is this organ, which is all about making connections, wastefully divided? The answer lies in the need to pay two different kinds of attention to the world. To stay alive we need to eat and, at the same time, watch out for predators, i.e. we need to attend to the world in two ways. This is best illustrated by this RSA Animate video, although I think nothing will serve as a substitute for reading the book. There was an interesting discussion later in the course about whether needing two different kinds of attention means that we have to be able to multi-task, but Iain said, no, we can only focus our attention on one thing at a time. There might be a lot going on at the periphery of our vision and attention, and our focus might rapidly change from one thing to another, but we can only focus our attention on one thing at a time. Attention creates the world we live in. It changes the world. We can only know the world we can attend to. The two hemispheres pay different kinds of attention, therefore it follows that the two hemispheres create two worlds. We each inhabit two worlds, which can be depicted by the Yin Yang symbol or Escher’s hands. The purpose of Iain’s work is to elucidate and provide evidence for his concern that in the Western hemisphere the left hemisphere’s view of the world dominates our culture and through this we lose an embodied experience of the world. We need more balance. Each hemisphere’s view is necessary, but each is not as truthful. The message that Iain wants us to take from his book is that the right hemisphere’s view is more like reality. ‘The divided nature of our reality has been a consistent observation since humanity has been sufficiently self-conscious to reflect on it. That most classical representative of the modern self-conscious spirit, Goethe’s Faust, famously declared that ‘two souls, alas! Dwell in my breast’ […]. Schopenhauer described two completely distinct forms of experience […]; Bergson referred to two different orders of reality […]. Scheler described the human being as a citizen of two worlds […] and said that all great European philosophers, like Kant, who use the same formulation, had seen as much.’ (p.461-462, The Master and his Emissary). The key message for me from this session is that differences are important. This resonates because my recent research suggests that it is difficult to maintain and sustain diversity and heterogeneity in a community; communities tend towards homogeneity. This can close down the possibility for seeing alternative perspectives. It is multiplicity and difference that enrich our lives. Thanks Jenny. I love reading your accounts of the course. This post made me think of a personal learning challenge that I have had for some time and have not yet fully achieved. I have been knitting since I was about 6 years old and use the English or ‘throwing’ method that I was taught so I have performed the physical actions associated with it hundreds of thousands of times. I can literally do this with my eyes closed. I’ve become fascinated with the Continental or ‘picking’ method – it looks faster and smoother somehow when done by expert knitters. I tried learning from youtube videos and that wasn’t enough so I enrolled on a one day Fair Isle workshop that included the technique (since using a hand for each of the two colours of yarn). So did I learn? Yes and no. I can achieve the picking technique but look and feel uncomfortable as yet – and currently I am much faster with my familiar technique. The workshop teacher helped me by explaining that my challenge was ‘muscle learning’ and I’ve been trying to make sense of that in terms of left and right hemisphere functions. I am wondering how I can connect my left hemisphere abstractions of ‘picking’ can help me as I perform the technique repeatedly until I become comfortable in doing it. Does that make sense? There is an element of unlearning here but apparently I wiil be able to own both techniques and choose which to use. This has benefits for my aging body, allowing me to rest muscles and joints. Hi Frances – what an interesting comment and interesting context for your questions. Thank you and yes it does make sense. This seems to me to relate to what McGilchrist says about learning to play a musical piece and performing it. My understanding (and I am still learning a lot about McGilchrist’s ideas and still have a lot to understand) is that the left hemisphere is needed for the ‘unpicking’, i.e. the working with and close analysis of the parts, but that the right hemisphere is needed for seeing the whole. I don’t know what McGilchrist would say to this. Practise is obviously important, but maybe also not trying too hard and being open to the possibility of an embodied experience. I wonder if this makes sense and whether it is possible or would make a difference. Thanks Frances – that’s a really interesting example to think about. 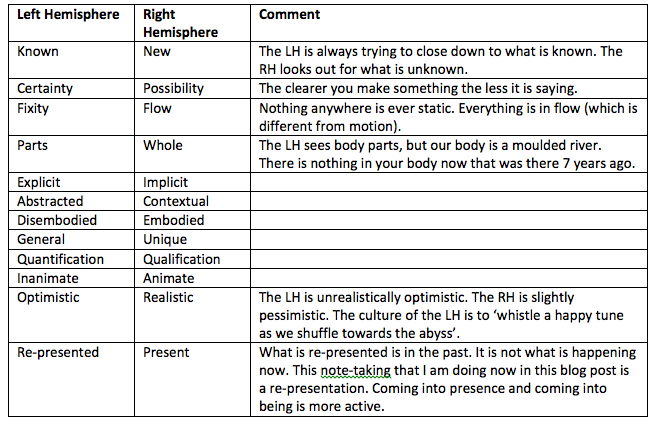 Hi Frances – I have now remembered that in 2012 I wrote a post about Embodied Learning – https://jennymackness.wordpress.com/2012/04/04/embodied-learning/ I wonder if this would be relevant to this discussion.